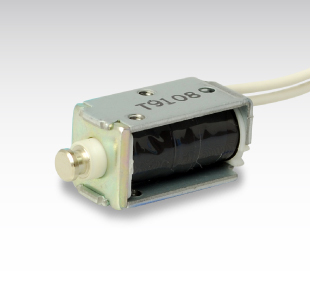 Solenoid Manufacturer - Takaha Kiko Co., Ltd.
Company Name: Takaha Kiko Co., Ltd.
Takaha Kiko was established in 1979. In addition to the fact that we have been welcomed as the dedicated maker of today’s solar solenoid conductors, we are deeply grateful for the powerful support from our customers as well as the courteous support of the companies with whom we have collaborated over many years. Since its establishment, our company has stuck to the ideal of “consistent production.” Through manufacturing nearly every individual part included in a solenoid conductors with consistent production control at in our own factories, we continue to realize low prices, high quality, and short delivery time. We have received especially high praise from our customers regarding the practical application of our fully consistent system for the speedy production of prototypes, which has been lauded along with the high quality of our products. A solenoid is an electrical device that move a plunger in a straight line by running an electric current through a coil and using the resultant magnetic force. 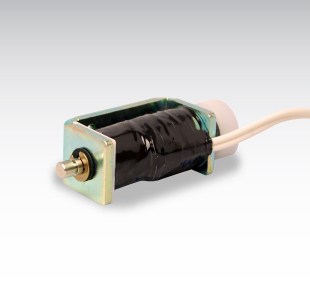 A solenoid is used in inductors, electromagnets, antennas, valves, and many more. The application of a solenoid varies in many different types of industries such as automobiles/cars, industrial machinery, air conditioning systems, agricultural systems, medical equipment, locking mechanisms and even in simple household electronics. For more details about the basic construction of solenoid actuators and demonstrates the relationship between strenght and hold power relative to current flow in the coil, click here (What is Solenoid?). Open frame pull solenoid is a regular solenoid. It is known as a “pull solenoid” because it pulls in the movable iron core when activated. It is relatively low cost and is widely used in office electronics, automobiles, and similar applications. A push solenoid has a push bar attached to the curved head of the plunger. 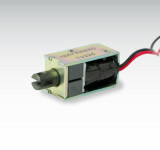 With the push bar, this solenoid can attract and repel at the same time. It is able to simply push, so no complex mechanisms are necessary. 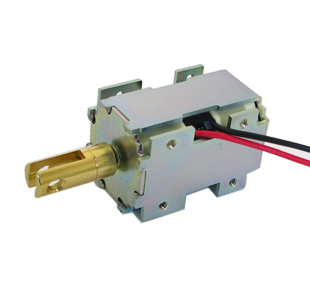 A magnetic latching solenoid is equipped with a permanent magnet that keeps the plunger in position magnetically when under no other force. With the internal permanent magnet maintaining attachment, only consuming power to reinstate attraction, these are widely used in locks and other mechanisms which require long-term attachment. 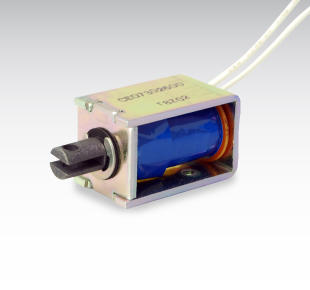 The Hercules Solenoid has pulling power to 40% more than conventional products. The Hercules solenoid achieves a stronger pull force than a similar size model of pull solenoid because it uses materials with a higher permeability than standard iron materials, which increases the magnetic flux density, and it minimizes the gap between components. TTP solenoid is good for lock. Energizing time is about 20ms.The right and left 2 position are held by the permanent magnet.Mechanical holding mechanism and the return spring is not required, it is the simplify mechanism. In order to respond precisely to the needs of the market, we use a single process from development to solenoid manufacturing and assembly. Takaha’s integrated manufacturing system demonstrates the full extent of the technologies we possess. Takaha Kiko handles every part of the process necessary to make a solenoid, from our manufacturing division, which handles molds, presses and machining, up to the end of production. Thanks to a quality control system under the direct supervision of our president, we execute with consistency, allowing us to respond to the needs of clients, including short delivery times, low prices and unique specifications. Takaha Kiko, Japanese Solenoid Manufacturer, will be showcased solenoid products at the Xhub Space Silicon Valley on Jan. 15th and at the Exploratorium on Jan. 17th. For more details, please check their Facebook below. An amusing contest using solenoid “Takaha Solecon” is held again! Entries from January 9th, 2018! Solenoid Manufacturer Takaha Kiko, announce the Solenoid Contest (Solecon) will be held on 2018 again. The Solecon 2018 entry begins on January 9th, 2018 and ends on February 12th, 2018. Please submit your innovative ideas with using Takaha Kiko’s solenoid for a chance to win great prizes! Japan’s solenoid manufacturer leader Takaha Kiko announced start to supply the clapping robot “Big Crapper” on 2018, and they are currently accepting 100 pre-orders now. Clapping robot “Big Crapper” is developed and manufactured by Bye bye World Inc. where located in Tokyo, Japan. “Big Crappie” is produced real clapping sounds from a shape hand made of special material, and to use for gets fun and rock in various occasion such as party, attracting people at front of store, supporting member of sports game, and in business. Takaha Kiko Co., Ltd. – We are pleased to announce the Solenoid Contest(Solecon) will be held on 2017 again. The 4th Solecon entry begins on January 4th, 2017 and ends on February 12th, 2017. Please submit your innovative ideas with using Takaha Kikou’s solenoid for a chance to win great prizes! The Grand Prize Winners will get $500, flight ticket to Japan, and solenoid gift certificate($500). The other prize is also great!! A solenoid is an electrical device that move a plunger in a straight line by running an electric current through a coil and using the resultant magnetic force. This straight line movement allows us to reach speeds unachievable with a motor, making solenoids suitable for a wide range of uses and limited only by your imagination.